At Safety 1st, our goal is to give parents the peace of mind that comes from knowing that they are giving their children the best products at affordable prices. 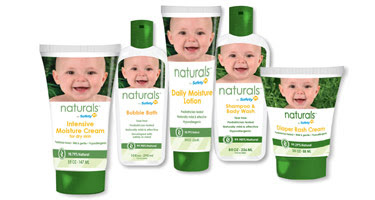 After years of experience providing innovative bath-time products that fit every home, we have worked with parents to develop natural baby bath and body care that you can count on to be, not just safe and effective, but Safety 1st safe and naturally effective: Naturals™ by Safety 1st. My children both have extremely sensitive skin so I'm always careful when purchasing skincare. The all new Naturals skincare line by Safety 1st is formulated without harsh additives, so I was excited to give it a try! The bubble bath softens the water, with a generous amount of suds - and left the princesses skin soft and clean. The Shampoo & Body Wash was put to the test with the princesses curly hair (without the right shampoo it can end in a tangled mess) and I was pleasantly surprised with the soft results; I combed her hair without issue (and didn't even have to add detangler). Following her bath we used the Daily Moisture Lotion, leaving her skin soft and smooth. The non greasy formula blends into the skin rather than laying on the surface like most moisturizers. All products worked wonderfully on the princesses sensitive skin. Without harsh additives (like dies or overpowering fragrance) and natural ingredients - these products are new favorites in our home! You can find the Naturals Skincare Line by Safety 1st at a retailer near you! Experience the new Naturals Skincare Line for yourself! One Lucky Reader will receive a prize pack with each of the new item's from the line. Visit the Safety 1st site and leave a comment with another item of theirs that you would like to have for your little one. The comment is considered your entry. I'd like to have the Go Hybrid Booster Car Seat for my daughter! I would love to get the Deluxe Funtime Froggy Bath Center. #1 I entered the children's place giftcard giveaway. #2 I entered the children's place giftcard giveaway. We need the Froggy & Friends Bath Mat at my house. And my kids would love to have the Soothing Stars night lights! Hello, I follow on GFC another product I would like to have on Safety first is the Disney® Music & Lights™ Walker. Thanks for a great giveaway! Like the Deluxe Funtime Froggy Bath Center. I would like the Complete Air™ 65 Convertible Car Seat..thanks! I'm a follower. I would love to have Safety 1st's new air protect car seat. I'd love to try their comfy cushy potty!